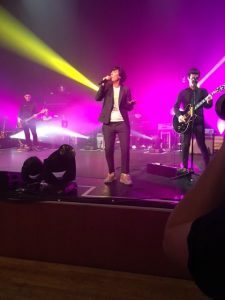 With her trademark swept-across the forehead, mop of black hair and soulful voice, Sharleen Spiteri and her band gave the crowd in St David’s Hall a powerhouse of a performance, belting out hit after hit and all along never missing a beat or sounding out of tune! Sharleen wasted no time in getting the crowd (mostly in the 40+ range, a testament to the longevity and lasting appeal of the band no doubt) up on their feet and rocking along to their greatest hits including Halo, Say What You Want, Black Eyed Boy, In Our Lifetime and a sublime version of In Demand, getting the whole of St David’s Hall singing along nicely. 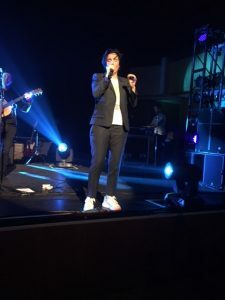 In fact, Sharleen had a great rapport with the audience throughout the concert – taking great joy in telling the audience that her partner was from Wales and playfully poking fun at her young keyboard player’s love life which had the audience in stitches. After a brilliant cover of Elvis’ Suspicious Minds, it was a nice touch that the band finished off the concert with the hit that propelled them to fame, I Don’t Want A Lover, leaving the audience shouting for more, and I doubt that anyone left disappointed.